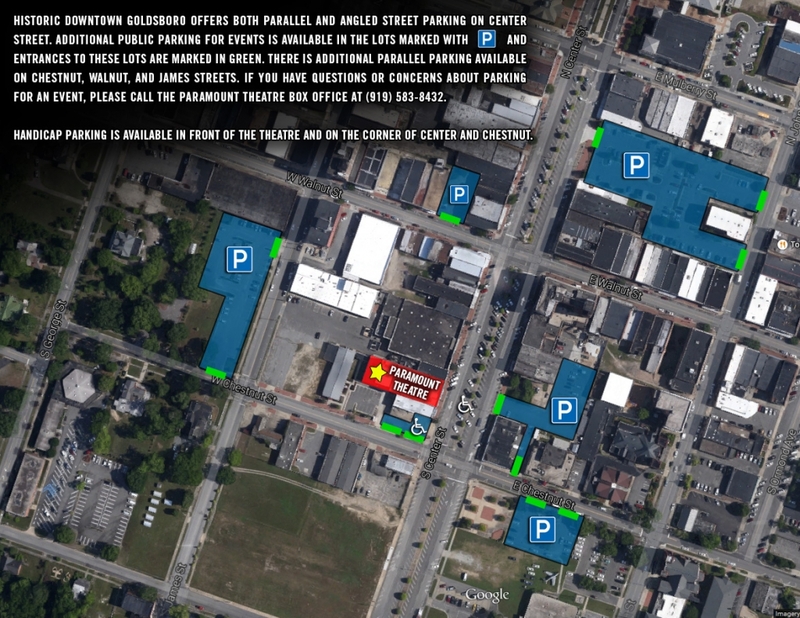 The Paramount Theatre is located in Historic Downtown Goldsboro at 139 South Center Street. Please use the map or directions below to finding us. If you need help with directions, feel free to call us at (919) 583-8432. From Kinston – Take US Highway 70 West towards Goldsboro, Smithfield and Raleigh. Proceed for approximately 17 miles. You will be on the Martin Luther King, Jr. Expressway once inside the Goldsboro city limits. Take the Cherry Hospital/Ash Street exit towards downtown Goldsboro. Turn right onto Ash Street and proceed for approximately 1.5 miles. Take right onto S. Center Street at the traffic circle. The Paramount Theatre will be on your right past the corner of Walnut Street and Center Street. From Wilmington – Take I-40 West towards Raleigh. Proceed for approximately 75 miles due west. Exit onto NC Highway 403 North/US Highway 117 North towards Mount Olive and Goldsboro. Proceed due north for approximately 20 miles and take the Cherry Hospital/Ash Street exit towards downtown Goldsboro. Turn left onto Ash Street and proceed for approximately 1.5 miles. Take right onto S. Center Street at the traffic circle. The Paramount Theatre will be on your right past the corner of Walnut Street and Center Street. From Raleigh – Take I-40 East towards US Highway 70 East towards Smithfield, Goldsboro and Kinston. Merge onto US Highway 70 East and continue due east for approximately 45 miles. Turn right onto US 117 South and take the Cherry Hospital/Ash Street exit. Turn right onto Ash Street and proceed for approximately 1.5 miles. Take right onto S. Center Street at the traffic circle. The Paramount Theatre will be on your right past the corner of Walnut Street and Center Street. From Wilson – Take the US Highway 117 South Bypass towards Goldsboro, Mount Olive and Wilmington. Proceed for approximately 18 miles due south. Take the Cherry Hospital/Ash Street exit towards downtown Goldsboro. Turn right onto Ash Street and proceed for approximately 1.5 miles. Take right onto S. Center Street at the traffic circle. The Paramount Theatre will be on your right past the corner of Walnut Street and Center Street.